I happily stared at the restaurant banners in the hotel lobby and, for the nth time, thought about how awesome Fujairah is in every aspect. With the commodity prices on the rise, I never though that in this day and age, a 95 AED Friday Brunch and a 100 AED dinner buffet in a hotel can still exist. 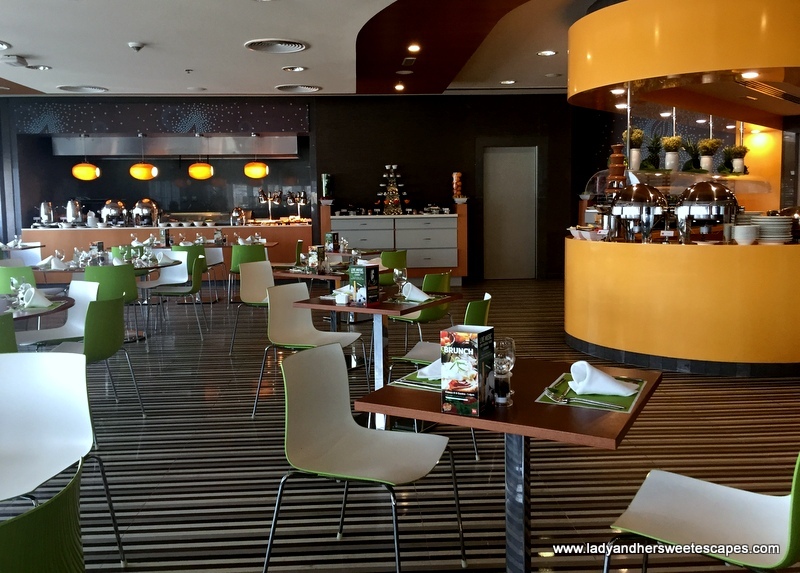 Minutes after breakfast, Ed and I were toured around Novotel-Ibis-Adagio hotel complex and were introduced to iL Centro restaurant where we were invited for brunch. Because of its name, I instantly thought we will be feasting on Italian cuisine, then I was informed that we will be having more! For weekend brunch, iL Centro offers cuisines from around the globe at a very affordable price. At 1 PM, iL Centro donned a fun and casual atmosphere. The contemporary furnishing in bright tones, together with the lively music played by the DJ, created a vibe suitable for a long and relaxing weekend feast. The restaurant was quickly filled with guests, mostly families, when the clock struck 2. 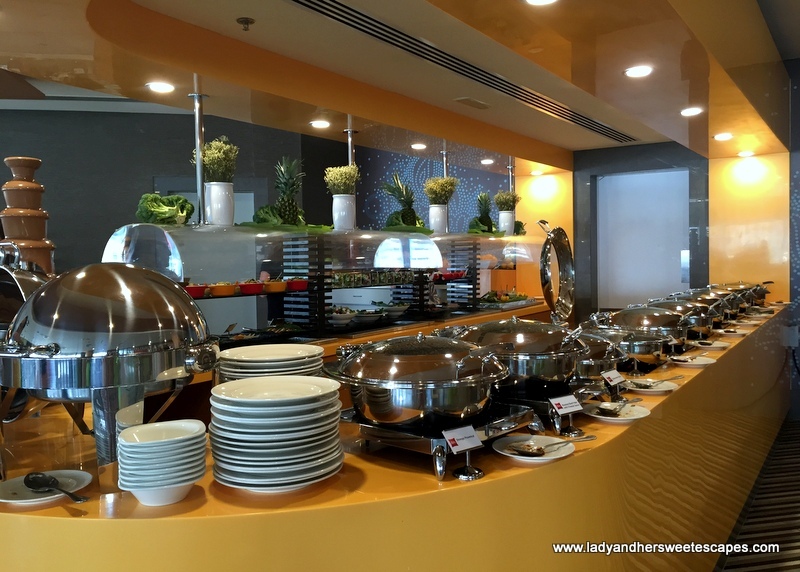 The buffet spread is just as wonderful as the ambiance! With the affordable price tag, I never expected it to be as extensive as the costly buffets in Dubai. A long counter was topped with excellent selection of appetizers, a line of international main dishes, and a chocolate fountain. Lamb Tagine and Prawns Provencale stood out from the rest! iL Centro also has an open kitchen lined with raw meat for the grill station and some roasted items. One of the dishes that instantly caught my eye is the roasted lamb with Yorkshire pudding. I'd be happier if it was beef, but no complains. The lamb meat was well-cooked, fork-tender and delicious! 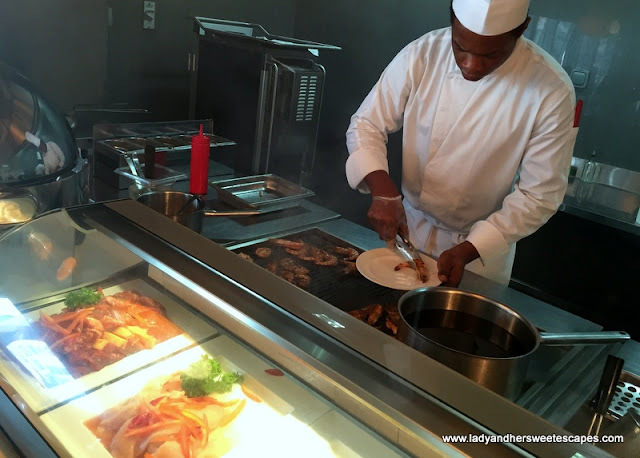 Live-cooking station always complete my buffet dining experience. I simply love to see how my food was cooked; hence I requested for grilled prawns at iL Centro's open kitchen. Four huge succulent grilled prawns were delivered to our table minutes after. Yum! Oh how I was thankful for the grill station, but I wouldn't deny that I hated it at one point. It's all because of the smoke coming out from the open kitchen to the dining hall. However, the issue was quickly attended by the staff. Their service was really commendable throughout the brunch. Aside from the chocolate fountain in the main buffet counter, I found two more tables dedicated for my sweet-tooth cravings. The desserts were wonderfully presented, like the fruit slices in mason jars and the elegantly embellished cakes!